Formed in 2004 in Fullerton, CA, Cold War Kids have already established themselves as a mainstay in modern rock music. However, their foundation was shaken by unexpected success last year when their song, “First,” spent eight weeks at No. 1 on Billboard‘s Alternative Songs chart and went on to become the second-longest-running single in the chart’s history. For perhaps the first time in his career, Nathan Willett allowed himself to embrace happiness. “[I felt like] I had really accomplished something,” he admits, outwardly surprised by his own excitement. In addition to a major label signing with Capitol Records, the band’s chart success resulted in a renewed sense of making music. Cold War Kids’ sixth album, LA Divine, is the product of this special moment in their timeline. But 2016 was, by all accounts, a tumultuous year. It was a year full of tension and divide: “People were talking about race in America and between police brutality and riots, etc., basically pointing out the idea that this is not a year that has more violence than previous years; this is just a year that we are now aware of what’s always been happening.” Cold War Kids’ achievement coincided with a period of increased anxiety, fear and uncertainty in the surrounding world, and that fact was not lost on them. Willett’s most personal record to-date finds him wrestling to maintain balance in his own life while he contemplates and reacts to everything going on around him: Thoughts on racial injustice, politics, immigration, and privilege combine with matters of the heart, pursuing one’s dreams, nurturing relationships, and more. “I think that the world can be a very unfair place, but at the same time it’s full of a lot of beauty, and a lot of reason to hope.” That cautious optimism shines through on LA Divine as Cold War Kids tie complex themes together in a seamless, brilliantly expressive display of musical emotion. Willett considers it the best record Cold War Kids have ever made. LA Divine is out now on Capitol Records. Atwood Magazine dove deep into the record with Nathan Willett in advance of the album’s release. 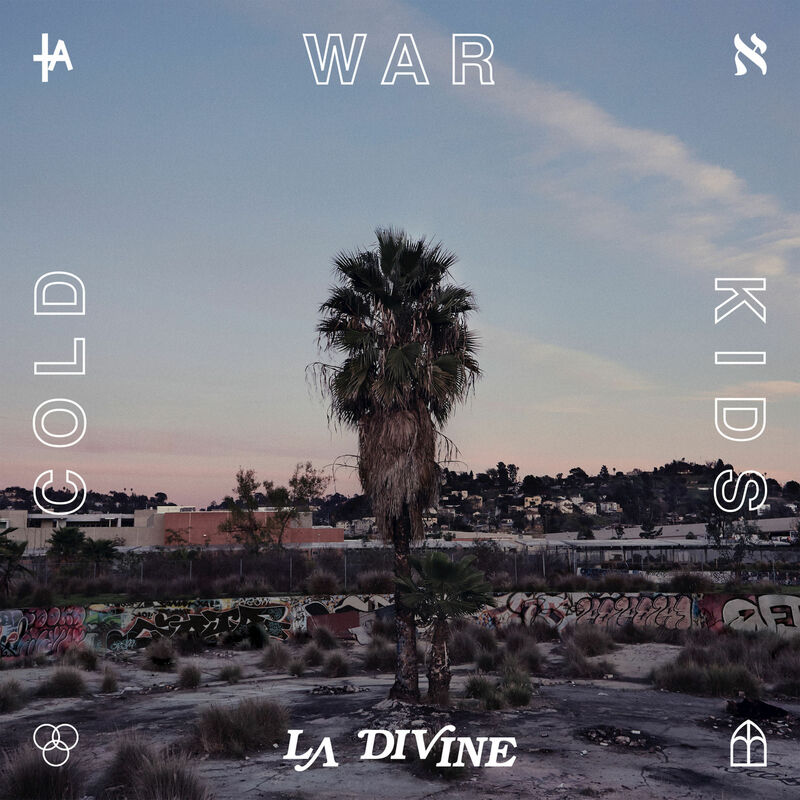 Learn about the substance and story behind Cold War Kids’ latest album, and access LA Divine HERE. Atwood Magazine: The album’s title “LA Divine” has been described as an ode to Los Angeles. What effect has LA had on you recently – why recognize the city now? Nathan Willett: I think we have a unique relationship to LA, in that we kind of grew up around it, and not in it – not in the culture, or celebrity, or money, that make up a lot of the cliché idea of it. I think there’s a lot of identity that isn’t normally represented, and then I feel like Los Angeles’ identity is shifting within the country, too. There’s a lot of layers to it – a lot of reasons that it felt like a good time to show how this evolution is happening. But you’re not love-struck in your 20s. You’ve been around the block and seen a lot in your day, so what is your perspective? Willett: It’s not meant to be love-struck in the “new love” sense. It’s not naïve. The music and the writers, and the stuff in art and life that I’ve always been attracted to, have definitely been more of the seasoned perspective that isn’t just new love or breakups, but something much deeper than that: The ugly stuff that comes with real sacrifice. Life is not pretty pictures. Willett: Right, I’d always take a Leonard Cohen, Nina Simone take – the grittier stuff that’s not just like, “I know you don’t love me,” but it’s like, “I know you’re cheating on me and you don’t love me, but I’ll stick around anyway,” that kind of stuff that makes you go oh man, that’s crazy. That’s not exactly my take on it in my life, but that is the stuff that feels more substantial. You start with the exalting anthem “Love is Mystical,” but end with pain on “Free to Breathe.” If this life is all that we get, we better hope something good comes next. The world is changing, can you feel the tension? If you’re not angry, you must not be listening. Can you tell me about that last song, and the journey from point A to point B? Willett: You’re actually the first person to point out that song! The great thing about making a record is sort of planting seeds and seeing where it goes, and then by the end… In a way, everything gets to the place where you can write that song, that feels very timeless but also very of the moment, and very much where my head is at. Hopefully there’s poetry in it; it’s not just supposed to be a statement. I think the idea of we better hope something good comes next is both so simple, and also profound. There’s a lot of interpretations that can be brought to it, but that song is definitely informed by a year of watching police shootings, watching an insane presidential election, watching a lot of really tragic, sad, awful stuff. It’s from the perspective of two friends sitting and talking, and kind of debating about the idea of “it’s on our shoulders to set the world right.” I do think that’s a lot of what I feel – I have the luxury of being able to be a musician and write songs, and sit around and talk about how the world could be better, why it’s so screwed up, etc… Life is very precious and it doesn’t last forever, and we could sit around and talk all day about how it should be, but this year especially, I got that sense of just how… small we are, in a way, and how not in control of our destiny we are. I think that everyone kind of felt that. What was the recording process like, and when were you in the studio for this album? Willett: Well it’s interesting, because it was in the year of our song “First” doing so well, and we were in this major transition of what ended up being signing a new record deal with Capitol. We were starting a new record as this song was climbing in a way that was totally unexpected; it definitely was very rejuvenating for me to have that kind of energy going into it – not just another recording, but something that felt like it could really have a bigger reach than anything before. It started January 2016 and went through June, so a good chunk of the year, but because we were touring a lot and doing festivals here and there, it was nice to not try to do it all in one big chunk, but to always be out in the world, and then back in the studio. 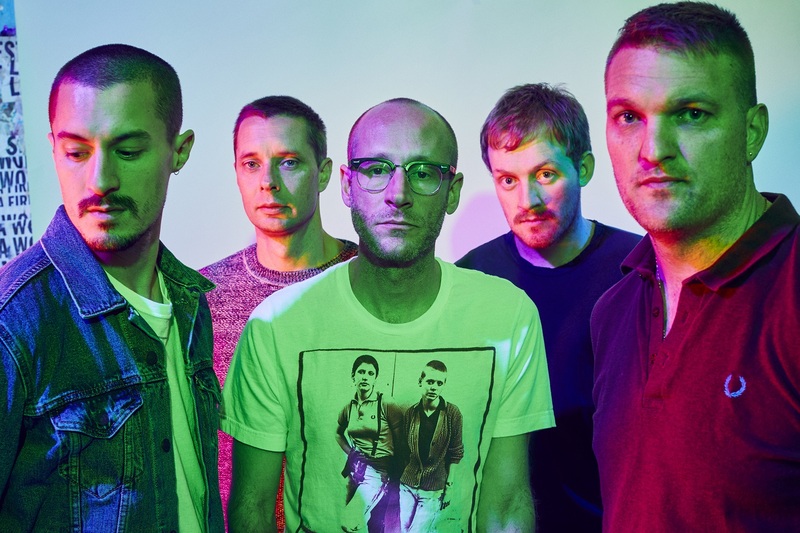 A few years ago, you were talking about Cold War Kids’ “growing up.” Do you find that to be a continuing trend in your music, and where (if at all) do you see that shine through on LA Divine? Willett: I think we always liked more serious music… It’s always been the playful side that I’ve had more trouble with. One shift, I feel, is that there’s always been a reticent to be like, if you’re going to talk about something political, then you must become a political band. I think that’s shifted this year; people don’t think are you going to be political, or is it better to not talk or think about that? I think people are realizing that the only people who are not going to have a voice about current events are the ones that have the luxury of not really caring, or are just out of touch and distant. I think that’s hit me this year more than before; I’m not a politically sophisticated person at all, but I think that if you’re a compassionate person, you’re going to write songs that are informed by what’s going on in the world, and hopefully they’re not going to be too abstract and fluffy, but rather can hit something and speak for people beyond our band and myself. I think that is definitely the other side of growing up – even with the LA Divine thing – at this point, the idea of splitting your fans down the middle based on a red/blue/whatever, like I think you just have to be yourself and say what you’re going to say, and understand that there are definitely people who are going to look at you and go, I totally disagree with this, and now I have to ask: Do I even like your music? It’s kind of a little bit of a gamble that you have to take, and again the record LA Divine, I think part of why LA is in a funny time is that it’s waving its freak flag a little bit: It represents something to the rest of the world that is really polarizing. But this isn’t Cold War Kids’ first time taking a stance. Your second album, Loyalty to Loyalty was written during the political firestorm that was George W. Bush’s presidency – you came down hard on whistleblowers, public servants, etc. Willett: I probably haven’t had enough people point that out to know whether or not that stuff is poking through to people… Yeah, I’m agreeing with you. I’d love to talk about the album’s little transition tracks. First up is “LA River.” “On the LA river, I know he’s familiar. But tell me why you want to stay in New York, where you don’t know anyone and you can’t find love. On the LA river…” Is that right? Willett: I actually like the words you have there. The difference is only a couple words, where you don’t know anyone and you can’t find work. I think yours is actually better, but yeah – all three of those songs were almost like the skits and interludes on hip-hop records that inform the bigger piece. I always wanted to do something like that, and as we were finishing this record, I was doing a few little things on my own that were meant to be messier. With “LA River,” I used this vinyl program that warbles and make things sound kind of scratchy. From our band’s beginning, we had a big group of friends who all kind of had a weirdly communal living thing happening in the Long Beach area. A good chunk of people all migrated to Brooklyn at the time when Brooklyn was doing that major shift that maybe, arguably, LA is doing now. So that’s part of where my head is at, that a lot of these people are now moving back to LA. It’s kind of more personal than that, but that’s kind of the backdrop for it. My brother is still there in New York, and I guess I kind of like the haiku vibe to these interludes that aren’t meant to be songs. “I want to be famous in your eyes, but the camera’s always on.” That’s one of my favorite lines on the entire record. Can you talk about “Cameras Always On”? Willett: That was one that, as we were talking about the record, I told some people that this was a little recording that is so sparse, but in a way it’s almost the centerpiece of the record. It’s just the simplest, most direct line, and I think it hits on everything the record is supposed to be about. “No Reason to Run” is so unique. This is another celebratory love song, so I have to ask, did a new love inspire you recently? Willett: No, but a renewed sense of making music. I think, for all the transitions that the band has gone through – even with different members – and again, making it in the context of having “First” do so well… and I think people have not just a renewed interest in our music, but… I don’t know, I’ve always thought of it in a way that, I love it when an artist is disconnected from the success of a single song, because it’s not really about that – it’s really about your art and what you have to say, and all those things. At the same time, I kind of realized, for better or for worse, that I actually was very excited and liberated, and felt a newfound freedom in having the success of that last record and that last song. So I think it was a lot of things, personally, for me, going to that point and being encouraged! It’s almost like it was a year that was spent of me feeling like I had really accomplished something, in some ways for the very first time. And there’s so many reasons for it… in a way, I think a lot of the liberation that came was from being a musician who wasn’t quite sure if I was really a musician, or really supposed to be doing this, or just kind of making the most out of something that I was maybe given by a fluke… and in the making of this record, I think there was the sense that, this is where I’m supposed to be – that this is lasting, and it’s working! I’m really proud of it in a way that I don’t know if I was ever really able to feel before. You keep going back to “First” and how this past year was such a big change for you. LA Divine definitely has its moments of feeling love and happiness, but it’s different. On “No Reason to Run,” you chant, I am defeated, I’ve got no reason to run. It’s like the negative person’s approach to acknowledging success. Even on your happy songs, there’s a darkness lingering there… Is that a bit of you dealing with “success”? Willett: Great question. I’ve always hoped that in the songs and in the process… it’s that kind of weird balance between, I don’t know exactly what this means – especially in relation to me! – but something about it feels very true. Especially that song, where I definitely don’t, in a way, know what it’s about, but you said it – it’s a funny kind of thing, that someone would look at love or self-acceptance or validation from the perspective of, alright! You win, I’m defeated as opposed to, I did it my way! For me, happiness is always to be mistrusted, and achieving something has always got to be filled with a lot of self-seeking and self-doubt. To write a song that feels very joyful, I think, you’ve got to be careful with it. It’s got to be filled with some pitfalls; it’s definitely true that “No Reason to Run” is really special and unique in its joyfulness, and hopefully the lyrics have that quality that is nuanced. I do think there’s an enormous component of being in love and surrendering to a relationship, that is about being defeated. This is a rabbit hole to go down, but my friends that are on Tinder, swiping the night away. My friends that are talking about love and commitment, and finding that perfect person, and all their struggles… I think that it’s shooting fish in a barrel to say that that’s a very backwards way of looking at a relationship and companionship, as opposed to the beauty and the kind of ugly stuff that comes with true sacrifice: Getting your way by not getting your way. That’s the stuff that’s really interesting, as opposed to just sifting through… When you hit that point where there’s no reason to run, where you’re defeated, being defeated is sort of losing and giving up your hopes and expectations. “Do you think we all hide from the truth? In ways, I do.” I think one of your best philosophical moments is on “Open Up the Heavens,” a rather ominous song where you relate yourself to Robin Hood. How did that song come about? Willett: Of course we all hide from the truth! No matter how well-behaved [we are], we know we think terrible thoughts. No matter how awful we are, we know we are capable of the greatest love. “Open Up the Heavens” is the most narrative of the songs. The character is an emigre. Sort of inspired by the Snowden story, and various stories of refugees from the last couple years. “Open Up the Heavens” is a command and a plea to open up the border. The heavens is safety, maybe America, anywhere that will have them. “We asked you real real nice – will you let us stay? Open up the heavens, we’re kicking down the gate – you smile real real wide and slap us in the face.” People’s reactions to hypothetical news about immigration versus an actual photograph of a baby washed up on the shore… We need those personal stories because they create sympathy. This song has some of my favorite lines. “I yelped a 5 star mole, a passport and a driver. My job is laying low a camouflage flamingo.” This was a real story my wife told me of a medical student that worked for her, who went on Yelp to find the best Mole who would transport him out of his country. I thought that was so great, I had to write that. Who could be more brave and more smart than this boy? To come to America, to come to Los Angeles to work at a tiny Family Practice Medical Clinic in East LA. It’s beyond the courage of anyone I know. He’s a hero to me. “Your friends say I’m playing the artist card, but they don’t sympathize when it gets too hard.” That line in “Part of the Night” really stuck out to me. What’s going on there? Willett: This is a song about a relationship dynamic that exists in a few of these songs – “Can We Hang On?”, “Restless”… A relationship with an artist is always difficult because you don’t have the same outlook, schedule, structure, as the regular world. You have to make illogical choices sometimes to follow your heart. So the character is saying, Look – your friends aren’t gonna understand us, they’re gonna think I’m being unfair to you, the world won’t understand us – we are a part of the night! “We defy any category, we set out to live two separate dreams.” What we are doing is sort of having all of our freedom and being in a relationship which is sort of impossible, but that’s what we are striving for, so of course it’s hard, but the sacrifices are worth it! We already spoke about “Free to Breathe,” but I’m really struck by how it looks forward in apprehension and tension. It’s very different from the rest of the album. Your balance of falsetto with chest voice is particularly powerful… So we get to the end of this album battling love, and you’re looking ahead in what – in fear? In apprehension? Willett: I do think there’s a lot of hope there, but it is a very melancholy song. I think that the world can be a very unfair place, but at the same time it’s full of a lot of beauty, and a lot of reason to hope. Looking at the year through the little markers of current events that gave me that lightbulb moment, people were talking about race in America and between police brutality and riots, etc., basically pointing out the idea that this is not a year that has more violence than previous years; this is just a year that we are now aware of what’s always been happening. I think that idea grabbed ahold of me so tight, not because it’s the first time I’ve ever heard it or thought it, but because now I think that is such a mainstream realization that people are having. I know that to even try to put all these ideas into songs runs the risk of being too abstract, and too big to be effective, but in a way – I sort of hesitate to say this – like, the image of an officer with his foot on a man’s neck, and the idea of, If only we were free to breathe, was sort of there. Again, that’s not what this song is about, but it’s a metaphor for how I feel about it. I think people are just more aware of that idea that, if one of us is not free, then we’re all not free. This year, I think that was more unanimously felt by people than those before it. Cold War Kids remain one of the most prolific acts I know. Your most impressive spurt felt like the two years that saw Dear Miss Lonelyhearts, Tuxedos, and Hold My Home. You also put out the aptly-titled Five Quick Cuts in 2015, before LA Divine. What is your songwriting process like, and how do you know when to call an album or EP finished? Willett: I have always had a kind of underdog mentality that tries to steer away from perfection and towards finishing. It is always a struggle. But also it is a survival tactic. We make our living being on tour, playing shows, and if we don’t have new material to play we will shrivel up and die. You must always be looking to the next thing or inspiration will be lost. Music is finished when it says what it needs to. This record LA Divine is the best we’ve made because we had just the right amount of time to make it great but not so much time that it would attempt to be perfect. Looking back on Robbers & Cowards and Loyalty to Loyalty, how would you say Cold War Kids have changed in the past 10 years? What do you think 2007’s Nathan Willett would be surprised to learn about 2017’s Nathan Willett? Willett: I think I’d be very surprised that I’d be sitting in the backyard of my home in Los Angeles, walking around a pool doing press for our sixth record – on Capitol Records. Every single thing of my life would be very surprising; I definitely did not anticipate this continuing to happen! Also, just being able to do it in a way that is substantial or meaningful – and by that, I mean, not having to sort of write pop songs to continue to have an existence! I’m very aware of how exceptional and rare it is to continue being in music and grow your audience, and do it in a way that is true to yourself. Those are three things that don’t go great together, and the fact that we’ve managed to do all that… It’s not a testament to our talent; it’s a testament to a lot of luck and a lot of hard work, and that’s it! Thanks Nathan, and congratulations on LA Divine!